Haiti’s president suggested Thursday that he might pardon former dictator Jean-Claude Duvalier, saying reconciliation for his nation is more important than making the man known as “Baby Doc” pay for his bloody rule. 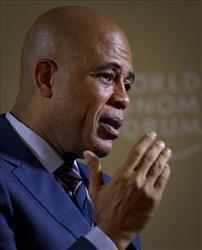 In an interview with The Associated Press, Michel Martelly pledged to respect the independence of the judge expected to rule within days on whether Duvalier should face trial on corruption and human rights violations. Duvalier was driven into exile in 1986 and returned to Haiti a year ago. But Martelly suggested he has little appetite for a trial that could be explosive for the Caribbean nation, recovering from decades of political turmoil and a devastating earthquake two years ago. Martelly also said he will build a Haitian security force to maintain order without U.N. peacekeepers _ more than 11,000 foreign military and police officers who have patrolled Haiti since 2004, and who have come under fire for allegations of sexual abuse and suspicion of being the source of a cholera outbreak that has killed nearly 7,000 people and sickened a half-million. The president refused to blame the United Nations for the problems, saying individual troops are responsible for their own misdeeds. But he said he wants to build a Haitian security force that will create jobs for 3,000-5,000 Haitian youths and help Haiti become self-sustaining. Martelly refused to put a time frame on an exit for the peacekeepers, saying he’ll need foreign cooperation to fund and train his security force. President Jean-Claude Duvalier must refuse to accept any suggestion of a pardon by President Martelly. A pardon is only applicable when there is something to be pardoned for. In Duvalier’s case, there was not, and is not anything to be pardoned for. History supports this fact. The courts of Haiti cannot – in all fairness – try Duvalier for anything, and everyone knows this. Outsiders are demanding his trial for crimes he did not commit…while ignoring both Aristide, Preval, and others…for crimes they did not commit. THIS MOVE – BY MARTELLY – IS A BADLY CONCEIVED CONCEPT THAT WILL ALLOW HIM TO PARDON ARISTIDE – PREVAL – CELESTIN – AMRAL DUCLONA AND OTHER REAL CRIMINALS. There is no point to accepting a gift with negatives values. Duvalier already possesses the truth and must not participate in the fool’s game conceived by Martelly, Aristide and Preval. God knows what Duvalier is and this is the only factor that counts. we know that he is responsible for crimes against the state. he should be summarily executed along with aristid, preval and all their cohorts. Eduj- You are one more comment from being blocked AGAIN- Stop with the profanity, or you will never see your comments here again. Conversations do not need to be abusive.